Are you sitting down?? If not, grab a seat, because I have a whopper of a deal to share with you! 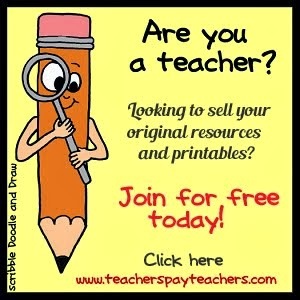 Today I am celebrating 100 followers on my TPT store and 1000 followers on pinterest. These are such big milestones for me and I can't believe how far my little blog has gotten. So to celebrate and thank all my followers, I am presenting an AMAZING giveaway for 68 products. Fabulous teachers at TeachersPayTeachers donated all of the products below (Some of which are now on my wishlist!) I've separated them into 4 packages to make it easy for you find your grade group. 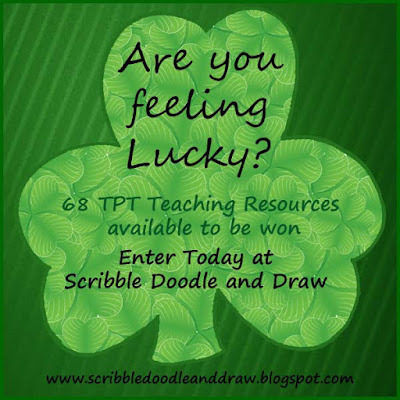 So are you feeling lucky? Enter the Rafflecopter below. The giveaway runs from Wed. Mar. 6, 2013- Sun. Mar. 10, 2013. 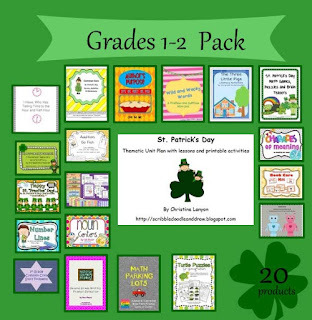 Included in this package is my St. Patrick's day literacy and math center activities, Graphing candy solid shapes, kindergarten math journal, find-tally-graph-spring, brain friendly numeral cards, kindergarten reading comprehension passages with multiple choice questions, outer space addition mats, Questions vs. statements, kindergarten morning work, sight word activities mega pack, super hero behavior and classroom management pack, hot cold mini guided readers, St. Patrick's day reading and math activities, number reading for primary classes, I have-who has? 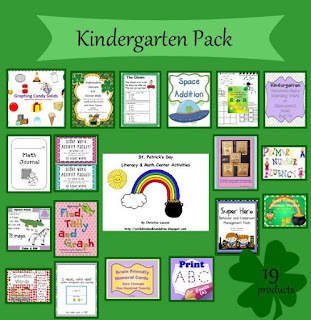 Number recognition, St. Patrick's rainbow rhymes matching game, Subtraction clovers cake walk style, Clip art alphabet animals A-Z, ABC print style family fonts. 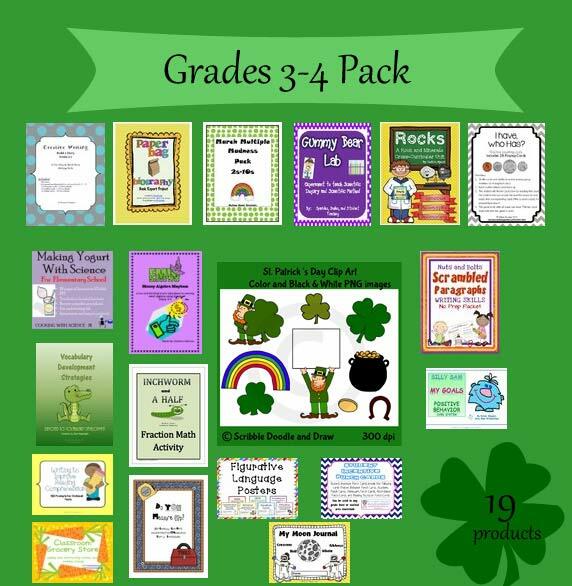 This package contains 20 products that would be perfect for grades 1-2. Included are my own St. Patrick's day thematic unit as well as Incredible Complete year-long Interactive Calendar math Smart Board +Extras, St. Patrick's day common core aligned games and more, Wild and Wacky words..a prefixes and suffixes mini-unit, My Leprechaun Shenanigans! 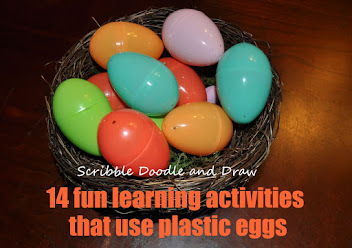 (A common Core Expository Writing Craftivity), Literacy Activities for "The Three Little pigs", Addition Go Fish Game, Charades of Meaning- Four FUN Shades of Meaning Activities/Games, St. Patrick's Day Math Games Puzzles and Brain Teasers, I Have who has Game for telling time to the half hour and hour, Common Core Math Story Problems bundle-1st Grade CCSS 1.0A.1-1.0A.2 - 1.0A.3, Tons of fun with Number Lines, Language Arts Nouns centers, Robots Love tens skip counting and ordering 10-100 by 10's, Turtle Puzzles for Young Solvers - 20+ puzzles and a bonus game, "St. Practice" day Craftivities! 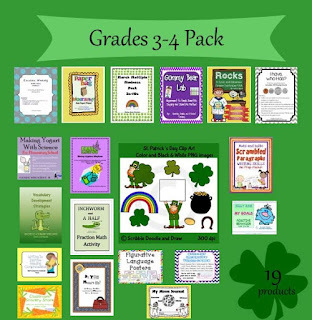 - St. Patrick's Day Fun!, Parking lot basic facts - Game or Center - Addition & Subtraction with cars, Author's Purpose Extravanganza- Easy as P.I.E., Classroom Library book care kit and Writing Prompt collection - 2nd grade - addresses common core standards. 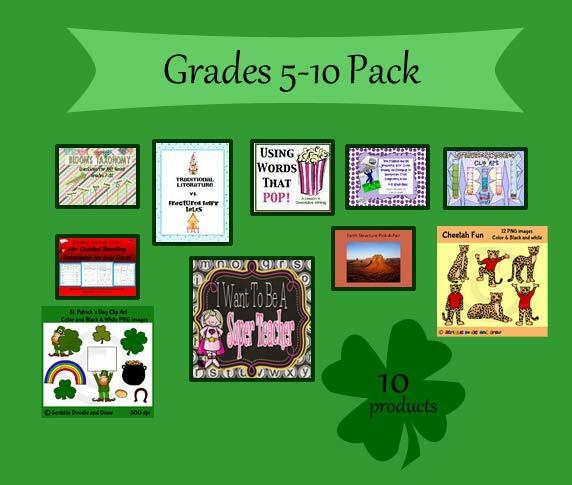 The Grade 5 -10 pack contains great teaching resources that perfect for a variety of grade levels. I have included my St. Patrick's day clipart pack as well as my Cheetah fun clip art pack. The winner will also receive; Earth Science pick a pair game, A choice of any product from Katie Smith's TPT store, Graduated Cylinders Clip Art, close reading 4-5 Grade Band: Exemplar #2 to incorporate text complexity, Descriptive writing- words that pop, Guided and Independent Reading Response Templates Common Core, Traditional literature versus Fractured Fairy Tales Book Report, and Bloom's Taxonomy Questions for any novel- 7-12. 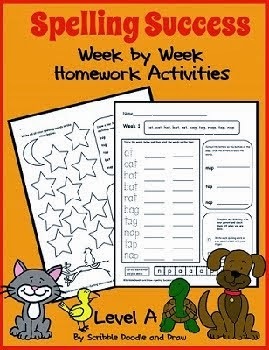 I would love to win the Kindergarten or the Grades 1-2 pack! I would love to win the K, 1-2, or 3-4 pack! I want to win the 1-2 pack. I would love to win the K or 1-2 pack! I just shared the giveaway on my Facebook page as well. I would love to win the 1-2 grade pack:) Great giveaway! I would love to win the kindergarten pack! Thanks so much for doing this giveaway! I would love to win the first grade pack! I would either love the K pack or the 1-2 pack!! 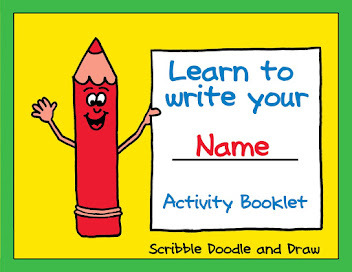 Would love to win the Kindergarten or Grade 1-2 packs! I would love to win the K or 1-2 packs!! 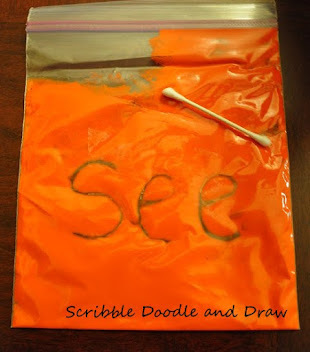 I am pinning and LOVING your Grade 1 prizes! WOW! What a contest.. This will definitely keep the Raffle-copter people busy! Happy to be a new follower of your blog! I would love to win any of the packs! My favorite is the 1-2 grade. Thank you all for entering and following my blog! Please add me to your board.